As I said in my two previous posts here and here, there was a lot going on on the day of the Quilted Field. One of the posts on the entertainment program, was a demonstration of Yakut wedding customs, especially on how to dress the bride. It all started with a small procession of the participants entering the field and the stage. First came the groom..
…then various family members and a shaman (…I think..). One person was at the microphone explaining what was happening, but only in Russian. We could guess quite a lot from what we saw happening on stage, but we probably missed out on a lot of interesting details. The bride came on stage already with the pink dress on, but there was a lot more to be added, both clothes, jewellery, belt, handbag, hat and mittens, – all of this in beautifully made traditional style clothing. Everything was done with slow, ceremonial movements while some haunting songs, reminiscent of sami joik, but not quite, were played in the background, occasionally interrupted by the storyteller explaining something. When the bride was ready, the groom came and led her to the other side of the stage, both holding on to opposite ends of what looked like a big tassel. In the end they danced some sort of line dance, – again with very slow motions and sombre faces, – very dignified. No hoopla or laughter. No wedding is without food and drink, of course, and they had brought some of their traditional foods and drink on to the stage. After the ceremony and dancing, they came around and offered the audience tastes of both food and drink, served in carved wooden vessels. The food was waffles and some small pancakes, – very good, – and the drink was white and had a sour-ish taste. After reading up on Yakut wedding traditions on the web, we think that it must have been fermented mare’s milk. Nobody got sick or died as far as we know, 😉 even though everyone drank from the same cup. This also gave us a chance of a closer glimpse of their wonderful attire, – all beautifully made with lots of details to admire. I should have liked to examine them all more closely and in person, but the photos will have to do. There was a lot of fur, as would be expected on traditional clothing from the coldest place on earth, but there was also woolen fabric and what looked like silk brocade on some of the coats. There was also lots of silver jewellery, some of which reminded me of the designs from Juhl’s Silver Gallery in Kautokeino, who has got their inspiration from the tundra and the people living there. Yakutia, or the Sakha republic as it is also called, is the largest republic in Russia, and is almost as far east and north as you can come in that country. This group had travelled 8-9 hours by plane to get to the festival, – all inland, which is telling of just how large this country is. The organizers had better cameras than mine, so the photos on their website have some more close ups and details from this event. Here is a Youtube video of a Dressing-the-bride ceremony at a big event in 2012. 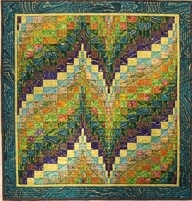 In my next post, we will take a closer look at some of their quilts. The mention of shoddy in my previous post, reminded me of a pillow I rescued from the bin when sorting out things at my parents’ house last summer. I think it originally came from our grandparents’ home, and I remember sleeping with that pillow when I was a little girl. It was very lumpy back then, and even worse now. Nobody else wanted it, and my first thought was to toss it, but then I rather liked the two fabrics it was made of, and since it would also be good for supporting the breakables during our drive back home, it went into the car instead of the bin. Back home I opened it up and emptied the filling into a plastic bag. This is what shoddy looks like after it has been inside a pillow that has been used for more than 60 years. Very lumpy indeed. Shoddy is made from old woolen garments, like the socks in my previous post, which have been shredded and carved into fibers, and then carded and made into fillings for pillows and duvets. Close up, one can see some of the original threads and many different coloured fibers. I washed the fabric and put it away in a plastic bin. Then we bought a new sofa, and I needed a couple of new pillows. 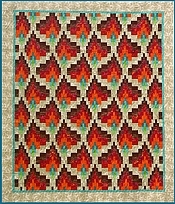 I had seen one in a recent quilting magazine which gave me some ideas, and when looking through my stash for some background fabric, the old pillow came to mind. I brought it out, and decided to use both fabrics, and I could even keep the old seam. I cut it one ruler width from the seam on both sides, and then cut the length into two parts, one for each pillow. Then I added strips of a blue cotton damask fabric, which I had dyed myself many years ago. The two backgrounds are a bit different in size as the inner pillows I had available were of two different sizes. I also turned the stripes horizontally on one, and vertically on the other. Then both backgrounds were layered and quilted with a wavy, on point, grid. Next, I drew lots of circles in three different sizes on paper backed fusible web. They were ironed on to the back side of many different yellow, orange, red, and some purple scraps. Then I placed my “flowers” on the green and blue background. I moved them around till I was satisfied with their placement, then ironed them down. I sewed around each circle using the satin stitch on my machine. 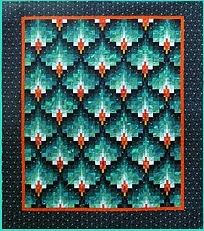 Since the background was layered and quilted, there was no need for a stabilizer. I drew some stems with chalk, and then sewed them using a wider satin stitch. In order to make some leaves, I ironed strips of different greens onto fusible web. Then I drew some leaf shapes in different sizes, and made some templates which I used to draw on the paper side of the fusible web already ironed to the strips. I cut out lots of leaves so I would have some to choose from when distributing them on the background. When I was satisfied with the placement, I ironed and sewed around all the leaves using the satin stitch. Then I only had to make backings for the pillows. Since I did not have zippers available, I made the envelope style backing. I use that a lot. And onto the sofa they went. I have spent the first days of 2011 updating the galleries at my website, a task that has been postponed way too long. While looking up photos of works that were finished during the last couple of years, I was reminded of some topics I had planned to write about on the blog here, but which did not happen at the time. One of the posts that have been on the back burner for a while, is this one about the chasubles I delivered to the small church in the village of Ålfoten in May 2010. This was a very special commission. The church is very old. According to oral tradition, it was built in 1610, so in 2010 they could celebrate the 400th anniversary of the building. 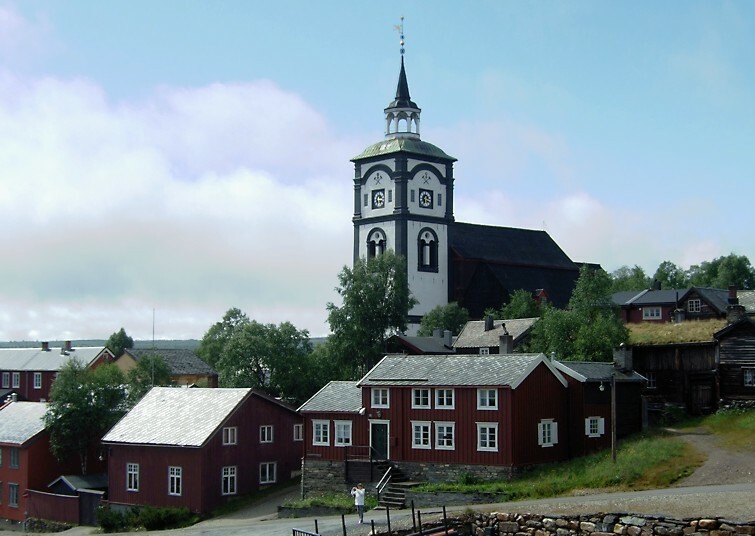 There is evidence that the chuch was built on the spot where an even older church had been standing, – possibly a stave church, – so the site has a long tradition of worship. I was contacted by the parish council in 2007 as they wanted to commission a green and a white chasuble to be finished in time for the 400th anniversary. 3 years may seem like a very generous time span in which to finish this, but these things take time, as the plans for the design, fabric choices, etc. must be approved by authorities on several levels before the actual sewing can begin. My first step in deciding on a design is to visit the church and take lots of photos. Working from photos alone is possible, but I think it is important to also visit the place in person to get to feel the atmosphere, so to speak. The photos are useful in several ways. In addition to reminding me of how things look, I can also scale the design proposals to a size that can be placed in the photo, in order to get an impression of how they will look in their proper place inside the church. An impression is all I get, however, – getting the fabric colours right by manipulating photos is nearly impossible. Fabrics ought to be seen live inside the church before deciding on the colour. Inside the church has bare timber walls, built log cabin style, and with no paint. The only painted items in the church are the pulpit and the large altar piece, – large compared to the size of the church, that is. The top of the piece cannot be seen from the seats, – it is so tall they had to remove part of the ceiling to fit it in, and you have to go quite close to see all of it. It is as old as the church, but was painted, or repainted, in 1767. Seen from a distance when entering the church, the visual impression, – except for the “wings” on each side, – is one of rectangles of different shapes, colour, and texture/pattern. In the church there is an old, red chasuble that is still in use. The parishioners wanted the new ones to be the same size as this one, and approximately the same shape. When I visited the churh the first time, a small and curious detail on the altar piece was pointed out to me. On the “wings” on each side of the altar piece, the twisted white oval surrounding the green branch has some red berries in between the twists. But one of the berries, – and only one, – is green instead of red. You can find it at the bottom in the oval to the right. 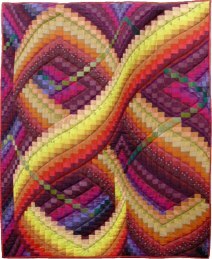 Nobody knows for certain why this one is different from the rest, but my thoughts went immediately to the stories we have heard about quilters making one obvious “mistake” so that the quilt should not be perfect, – the so called “humble block”. (The truth of, and/or reason for this is controversial, I know). Another possible explanation is that this is the “signature” of the crafts person who made or painted the altar piece. In any case, it is a special feature of this altar piece, which I chose to reflect in the design on the back of the green chasuble. One of the grapes to the right is green instead of red. The chasubles were officially delivered on the day of the anniversary service in May, – on Whitsunday. This was only a small part of everything that was going on, so with all the activities, I did not get a chance to get a decent photo of the chasubles inside the church. Since my husband was away on his job, I invited my mother to accompany me to the service and to the celebrations afterwards. She took this photo inside the church while I was presenting the facts and ideas that led to the finished designs. It was not easy to get a good shot as the church was very crowded, – there was even a tent set up outside for the ones who could not get inside the church itself. The service was recorded on video and sent live on the internet and on a large screen in the tent outside, and is still available here. Slide the time button to about 58 or 59 minutes into the video, and you can see two of the priests who attended the service acting as mannequins and walking the chasubles up and down the aisle so everyone could see them. After the service there was a large celebration in the school gym, which doubles as the village hall. These small villages really know how to organize and put on a celebration, and to make the guests feel welcome. With a population of less than 200, everyone had at least one thing, and in most cases several tasks, to do during the day, and everything went smoothly, – not one glitch was noticed during the whole day. The “rømmegrøt”, or “rjømegraut” in the local dialect, was served wedding style: a procession with a musician (usually playing a fiddle, but in this case an accordion) marching in front, and all the “waiters” each carrying a bowl coming behind in a long row. The “rjømegraut” was marched twice around the perimeter of the room before it was served on the tables. There were of course lots of congratulatory speeches, an overview of the history of the church, and lots of singing and music. And then there was coffee, tea, and cake for everyone. Lovely cream cake with a marzipan cover, – yum! Before we leave Ålfoten, I want to show you a few more details from the church itself. This is the baptismal font. Very handy when the space is limited like it is in this small church. On the side wall to the right there are two rows of wooden pegs. In former days the menfolk sat in the seats to the right, while the women were seated to the left (as seen from the entrance). These pegs were for the men to hang their hats on during the service. The women would leave their headwear on. The photoes above were all taken in summer time, but I had also occasion to see the church in winter time on one cold January day when I went there to photograph some fabric samples inside the church. I took care to be there in the middle of the day, so there would be some light. This was an ordinary day with no service, so the heating was not on, and the “mood” was quite different. There was ice on the window panes (which I could not resist capturing with my camera), but with the clear sky and the snow covered ground outside, we got the light we needed, even though it was different than in the summer. I guess it could sometimes have been as cold as this also during services in former times, when heating was less available. Have tested the satin stitch on my new Sapphire 870. Not bad, I think.